On Saturday morning we split into two groups. 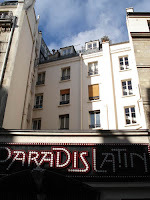 One half, led by Michael Osman visited three of the Grands Projets developed during the presidency of François Mitterrand that changed the face of Paris. The rest followed part of the path of the Philippe-Auguste 1210 City Wall. On the right is the Institute du Monde Arabe in the Latin Quarter. 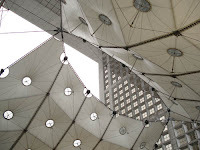 After visiting the Louvre Pyramid, Michael took them to La Défense, a commerical complex just outside the city limits. 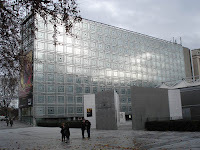 Its Grande Arche is in a line with L'Arche de Triomphe on the Champs-Elysées and the Louvre. Dr. Fowler led the tracing of a part of the 1210 wall in the 5th arrondissement. Here is a cross section of the wall that has been preserved in the middle of a modern fire station! While there are a few actual pieces of the wall left standing, we also saw the way in which the outline of the wall shaped the property-lines and buildings along its curving path. In the afternoon several of our group accompanied Michael and Dr. Bard out to Basilica St. Denis, where many French kings and queens were originally buried. 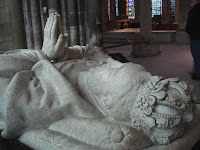 The church is full of wonderful effigies, including this one of Henri II.